Digital Radio Monodial (DRM) radio is a type of digital shortwave radio signal that is used by international shortwave radio broadcasters. It provides superior audio quality compared to AM signals by using digital audio encoding. With an upconverter, good antenna, and decoding software the RTL-SDR software defined radio can receive and decode DRM signals. This tutorial is also applicable to other software defined radios that can receive HF with or without an upconverter, such as the HackRF, Airspy, Softrock and Funcube dongle. YouTube user Superphish shows DRM reception with his Ham-it-up upconverter, and rtl-sdr. YouTube user vu2ufg shows another example of DRM reception with the RTL-SDR. An HF upconverter such as the recommended SpyVerter or ham-it-up, or a dongle modded for direct sampling (such as our already modded V3 dongle), or SDR# modded to use the experimental Oliver Jowett HF driver for regular RTL-SDR dongles. The DREAM DRM decoding software with AAC decoder. Virtual Audio Cable or VB-Cable. 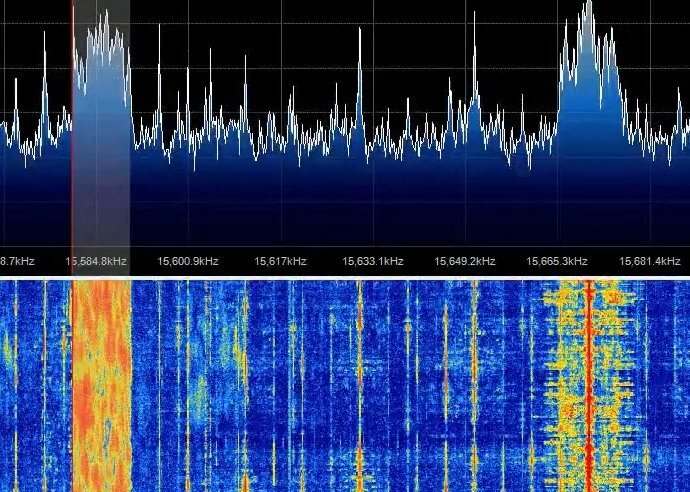 A DRM signal looks like this (left) on the waterfall, placed next to a normal shortwave AM signal (right). We will assume that you already have an HF capable SDR, such as the RTL-SDR V3 or an HF upconverter, and have set it up with SDR#. We also assume you already have an audio piping utility such as Virtual Audio Cable or VB-Cable set up on your system which allows the audio to be passed from SDRSharp to the decoding software. If you don’t have and not set these up, check out the Buy RTL-SDR and Quickstart pages, and head to the virtual audio cable download page (trial), or the VB-Cable download page (free). The sampling rate of your audio piping method must be set to 48000 samples/sec. To set this in Windows, right click your device in the Windows sound recording tab, go to properties and under the advanced tab, set the sample rate to 48000 Hz. Do the same to the same device under the Playback tab as well. Now, head to the DREAM download page, download DREAM and extract the zip file into a folder. DREAM is a free opensource DRM decoder. Due to software licence reasons the required audio decoder can not be shipped with the DREAM binary file. You can follow the instructions on the download page to compile your own faad2_drm.dll decoder, but as not everyone has compilation experience, a precompiled faad2_drm.dll download for windows can be found at this megaupload link. Note that using this file in some countries may not be legal due to patent laws. Place the faad2_drm.dll file into your DREAM folder. 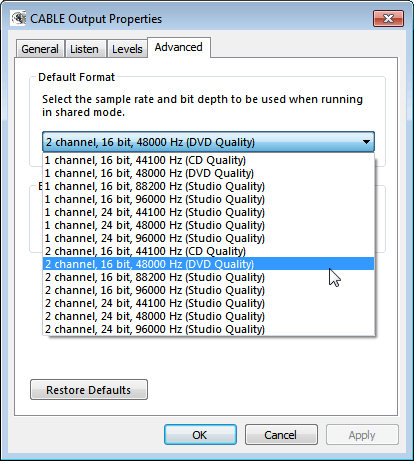 Now you can open SDRSharp, set virtual audio cable as the output audio device, and then tune to a DRM signal. DRM signals use upper side band (USB), and have a bandwidth of 10 kHz, so apply these settings to SDRSharp as well. Carefully align the left red line with the start of the signal. AGC can be left on, but it may need to be experimented with in order to get the best decoding performance. Now, open DREAM and then go to Settings -> Sound Card -> Signal Input -> Device and set Virtual Audio Cable or VB-Cable as the input device. Also, ensure that Settings -> Sound Card -> Signal Input -> Sample Rate is set to 48000 Hz. Try to get the green “Level [dB]” bar in DREAM to be near the center by adjusting the volume settings in SDRSharp. If everything is set up correctly, you should see three green bars underneath the volume meter and start seeing information about the DRM radio station you are tuned to in the window, and also begin to hear some audio. To receive DRM signals you will need a good HF antenna, placed up high. A simple long wire strung across your attic may work well. Look up “random wire antenna”. Also a magnetic loop antenna may be a good choice. RTL-SDR tends to place imaged broadcast AM signals into some DRM signals. This can cause decoding to completely fail. We suggest trying a HF filter that blocks the AM broadcast band. If you hear no audio when decoding, check that you have placed faad2_drm.dll into the DREAM folder correctly. DRM is a digital signal, so it will either work and play audio or it will not work at all. Poor reception may cause the audio to constantly drop out. Does anyone have a way to find the MacOS libfaad2_drm.dylib file necessary for audio decoding? I’ve got the version for MacOS10.5 but that won’t work with more ‘modern’ OSes ….. is it available? All India Radio DRM transmission service has been terminated in 2016. My DRM reception was started in July 2017, So I never had a chance to receive it in china. But my friend sent me a medium frequency recording file, then I used the Dream software to decoding it, and found that it had two channels of audio transmission, one channel to transmission the news, another channel to transmission music,that’s interesting. Are these stations still working? 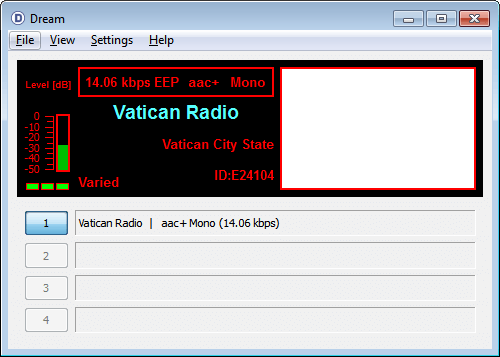 I built up-converter, i received only one program (sdrsharp+dream) 7-8PM. That’s all ? DRM is still around, though it’s popularity is still low. See the worldwide broadcast schedule here http://www.hfcc.org/drm/. March 20, 2017 - 4:42 pm Mark B. You have the audio output looped into the input and mixed with the signal, corrupting it. Your audio loop settings are not correct. Hi， I come from Chinese, I very expect to receive DRM radio, I used a Digital TV Broadcasting with RTL2832U and SDRsharp and dream software, but let me feel is disappointed , I use SDRSharp scanning signal that not found the DRM, who can give me a DRM radio frequency table? My email is [email protected] qq.com or [email protected] and I hope you can give me help, thank you! AIR is transmitting DRM in Tricky. The correct frequency is 945 kHz with 9 kHz bandwidth in 16 QAM modulation. To receive it on any modified SDR, full 9 kHz bandwidth is required digital processing. So the filter quality is very important. Curious if a DRM modulator is available for testing on bench a pirate fun. Is there a software for transmitting DRM through GNURadio? that creepy megaupload link is probably outdated and they won”t let me in with my browser. how insane is it that i normal non computer savvy people are supposed to compile a program to get some freeware running?? Let me have your email and I’ll send it to you………. You do NOT want to use that Megaupload site. It will attempt to put about 50 MB of crap on your computer if you consent to the download.